I'm pretty sure this week's Free GM Resource is related to last week's resource, but it needed it's own callout. The Fantasy Name Generator is pretty straight-forward, generating.....fantasy names. What I really liked about this particular generator is that there are three categories of names (Serious, Fun, and Specialized) and a lot.....I mean a lot of individual generators. The generator doesn't just make a name, but a whole block of names, so you can have a bunch to choose from or just use. There are several specific generators I've never seen before, like a Pokemon name generator and a Hawaiian name generator. 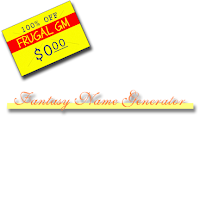 Thanks to Samuel Stoddard for version 1.5 of the Fantasy Name Generator!